Our story on 11 supercars impounded from con artist Russell Cole after bilking Best Buy out of $31 million brought in these photos from someone who used to tend to Cole's collection back when he'd swap day-old Bentleys because he didn't like the color. Anton Trizna, who used to detail Cole's cars, shared these photos of Cole's collection at its peak, along with a description of a man who seemed hell-bent on gathering super cars like they were Hot Wheels. The 11 cars valued at just under $3 million that will be sold at auction later this month were "the tip of the iceberg" in a cache that once included a McLaren SLR, a Saleen S7 and two Ferrari Enzos. Cole "was the owner of multiple (Bugatti) Veyrons because he became impatient while he waited for his to be built," Trizna told Jalopnik "He owned many Bentleys and once traded one in the day after he bought it because he didn't like the color anymore,"
Cole made his money by defrauding Best Buy on computer parts through his company, Chip Factory. Trizna said much of the gains Cole made from Chip Factory went to his car collection; the company had two warehouses — one where it did business, and the other for Cole's cars. Cole eventually built the large garage at his Deerfield, Ill., home once the collection grew larger than the Chip Factory warehouse could hold. At its peak, Trizna said the Chip Factory collection included a Ford GT, Lamborghini Diablo VT, Saleen S7, Lamborghini Murcielago roadster, Porsche Carrera GT, McLaren SLR, Ferrari 430 Spyder, Ferrari Enzo, Ferrari Superamerica and Aston Martin Vanquish. 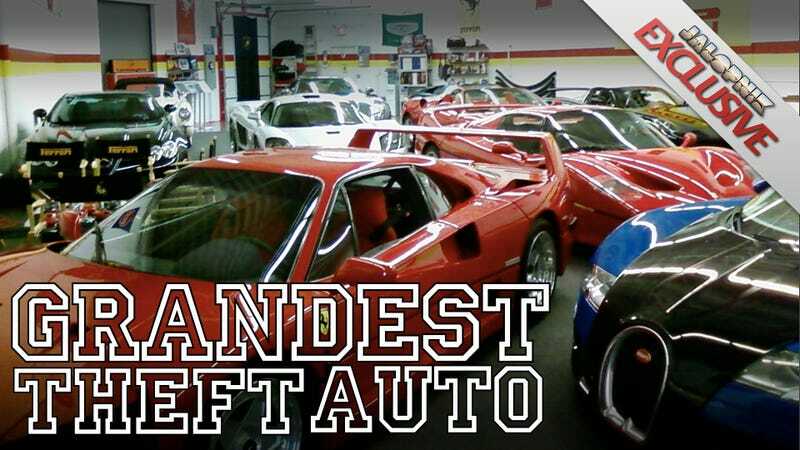 The second garage had 5 Ferraris: an Enzo, F50, F40, F430 and 599, as well as a Bugatti Veyron and several others. It was enough of a collection for Cole to pop up on CNBC and elsewhere as an expert on high-end automobiles. When Best Buy uncovered Cole's scheme in 2008, he began paring back, selling off many vehicles including several Ferraris. It would take a year before the company called in the federal government, which later discovered that Cole had skirted taxes while running his scam. There's still time to grab his ill-gotten wheels at the Manheim auction in Milwaukee on April 19.